Welcome to Healcraft’s Restoration Shaman 101 Guide! Our 101 guides attempt to give you everything you need to know in order to excel, in a brief format. As always, if you ever find out of date information (or just wrong information) please leave a comment below and we will amend it as soon as we see it! In addition, we cannot cover every aspect of the class in this guide, so be sure to click on the Raiding Guides and Theorycraft links above to read all of our information on healing classes! Healing Wave : Our version of the “cheap, slow, smallish” heal. A lot of our mana (especially in 25s) goes towards aoe healing spells, so glyphing this and using it heavily as a single-target spell is a viable option, depending on how you feel mana-wise. As mana regen goes up this tends to get used less, but still has its place on progression fights where you want most of your mana to go towards aoe healing. It gives you back 150% of its cost through resurgence, which is one of the reasons it’s so mana-friendly if you’re going to use heavily. Greater Healing Wave: Our version of the “slow but powerful” heal. With tidal waves up its cast time gets reduced to rival Healing Surges; and it’s SP co-efficicent is higher, so it scales better as gear goes up. Most shamans have been using Surge more in MoP with tidal waves up, because of the high crit chance. The 4-pc Tier 15 bonus has a lot of impact on the choice of which spell to use as your big simgle-target bomb though, I’ll get into that in detail in a seperate essay. Healing Surge : Our version of the “fast, expensive, strong” heal. Tidal waves gives this a very yummy +30% chance to crit, which has 3 benefits for us; much bigger heal, mana back from resurgence, and proccing AA to smart-heal the most injured party member within 40 yards. Honestly I used this 95% of the time vs GHW in Tier 14; this has changed somewhat with Tier 15 (especially with our 4-pc bonus), but not totally. Riptide: Now we start getting into signature Shaman spells! Riptide is our only targetable HoT, and does a good amount of healing on its own. Has the added bonus of boosting Chain Heals targeted at it by 25%. Should be cast on c/d or as close to it as possible to spread your HoTs around (try to keep it up on the tanks) and to refresh tidal waves. It can be glyphed to remove the c/d. Chain Heal: Good ole chain heal. Although it’s nowhere near the glory days of Sunwell, it still has a place in the crafty Shamans toolbox. Obviously best used when you know you have 4 people in range of it that need healing, CH is our aoe heal to use when Healing Rain is already down, and damage is coming in. When targeted on someone with a ticking riptide, the CH becomes 25% more powerful. This is a very big factor and planning this out for aoe phases has a big impact on our HPS. Goes without saying that it gets much weaker in terms of HPM/HPS the less targets you hit. Always make sure you’re hitting atleast 3 with it; if only 2 better to swap to a single-target spell. Gives us tidal waves just like riptide does. Healing Rain: Awwwww yeah, big blue circle of wet goodness! Since the start of Cata, this has taken Chain Heals place as the defining Shaman healing spell, mainly because of the unique graphics that go along with it. Very large blue circle is hard to miss. It’s our strongest AOE healing spell, and placement/timing is everything. Try to place it where you can hit the most clumps of people. Much easier to do in 25s, but still worth using in 10s in most situations. If nothing else, there will almost always be a tank and a melee pile near each other for this to be targeted on. Earth Shield: Put it on the tank who will be taking the most damage. Along with the healing, it provides 20% boost to direct healing on this target. There are rare times when you might want to keep this on a non-tank; H-Garalon last tier for instance, depending on my role I was out of the tanks range for big stretches of time, wasn’t worth it to run to them and refresh with so much damage going out, I kept it on a ranged near me. But those are very rare, usually keep it on a tank. Unleash Elements: We use Earthliving as resto, so this casts a small heal on a target and boosts our next heal by 30%. This includes Healing Rain, which is what you’ll usually combine it with. The heal itself isn’t totally negligable either, althought it’s not huge it can be cast on the move which is a nice bonus. Water Shield: Another Shaman staple, water shield got an AMAZING change in MoP so that it now lasts an hour and doesn’t go away from damage. Anyone who healed H-Majordomo in Firelands knows what a pain it was to have to refresh it every 6-8 seconds or so with a lot of aoe damage going out. Very welcome change, not much to say here, keep it up 100%. Purify Spirit: We can purge almost as well as a real healer! Although we can do magic effects & curses, not being able to dispell poisons or diseases is a bit strange. Use when applicable, 8 second c/d on dispell now like all other dispells. Tidal Waves: Casting Riptide or Chain Heal gives you 2 stacks of Tidal Waves; with it up, Healing Surge has a +30% crit chance, and HW & GHW cast times are reduced by 30%. Keeping track of Tidal Waves and making the most of it is one of the main details that differentiates a competant resto shaman from a quality one. Earthliving: This is a HoT granted by our Earthliving weapon enchant. No way to directly control who it goes on, although chances are 100% for anyone under 35% health from our non-CH direct heals (CH is 50% for below 35% health targets). 12-second smallish HoT, on some fights it can make up a good % of our overall healing. Resurgence: This is another one that used to be a talent and is now baseline for all of us. You get a set amount of mana back from spells that crit (as long as you don’t forget to put up water shield). All our castable spells except healing rain (no totems). This is a big reason why crit has jumped up so much in priority compared to where it was in Dragon Soul, when Mastery was king. Ancestral Awakening: Yet another used-to-be-talent. It’s an instant smart-heal that targets the most injured player within 40yds for 30% of the initial heal, and it prcs from HW-GHW-HS-RT-UL crits. Although in usually is a small % of our overall healing done (especially on 25mans), it’s a great bonus to have because of the low overhealing and smart-targeting. Have I mentioned crit is good this expansion? Spirtwalkers Grace: 2-minute c/d that gives us 15 seconds of healing while moving, can be glyphed to 20 seconds. Should note that it is off the GCD. Without this we are limited to Riptide and UL on the move, this should get heavy use on almost every encounter. Just remember that if you’re using this to heal while avoiding a mechanic, say like Blade Lord’s tornado gauntlet or Durumu’s Disintegration Beam phase, you can’t ghost wolf at the same time, so it’s normal run speed. Ascendance: Our other big 3-min c/d, Ascendance lasts for 15 seconds and for resto spec gives us our own Ultraxxion green crystal. Meaning it duplicates healing done by us and spreads it evenly amongst the raid. Best used when you are putting out a lot of healing, so try to plan it for high damage phases when there will be players stacked. Casting this while everyone is in a UL-strengthened Healing Rain and you are spamming RT-strengthened Chain Heals will result in a huge spike in output. Casting this while everyone is spread out and you’re using single target spells on folks will be less effective. Healing Stream Totem: An awesome addition (well, change) to our healing kit, this is now a 30-second c/d that lasts 15 seconds and smart-heals the lowest health raid member within 40 yards. Very low overhealing, elite HPM, use this on cooldown. If you end up taking Call of the Elements, this will be the biggest benefit, an extra HST every 3 minutes. Not much to elaborate on, use this as often as possible. And place it in a good spot (detail that can get overlooked sometimes). Spirit Link Totem: SLT is our only damage reduction c/d, and is very unique in the way it functions. It last for 6 seconds, and redistributes health evenly between every player in range. Basically, it ties everyone together, and evens out HP, while reducing all damage taken by 10%. Very useful for tanks taking spike damage (if in range of other players), and for lowering overhealing in a big burst phase with a stack point (H-Megaera Ramage). Mana Tide Totem: The reason other healers like having us around, Mana Tide gives everyone in range 200% of our spirit as a boost for 16 seconds. The boost everyone gets is based on the shamans personal spirit, which is why you hear about some bleeding-edge guilds bringing one resto shaman who gems/reforges exclusively to spirit as a “mana battery”. Mana Tide only benefits from our base spirit, not temporary spirit gains, like Spirits of the Sun. MoP brings a huge change to talents, and no more “cookie-cutter” specs. Although there are some tiers where the choices seem obvious, there are definitely talents that are worth testing and shine in different situations. Tier 15: Choice here is between Stone Bulwark & Astral Shift. Both are viable but work differently. SB will absorb more damage overall, but AS is ideal for high-spike instances. SB is more for smaller peices of constant incoming damage. SB also costs mana and a GCD where AS does not, so that should be considered. Tier 30: Frozen power might have uses in very specific situations, but usually earthgrab is the better option in a raid. Very handy for slowing adds on quite a few fights (Tortos for example). Windwalk is an extremely useful totem that seems to get ignored quite often it is not a “PvP only” choice. I encourage people to test it on any encounter with movement-imparing effects, you might be suprised. Some examples from this expansion are Cobalt Overloads on Stone Guard & Blade Tempst on Blade Lord. 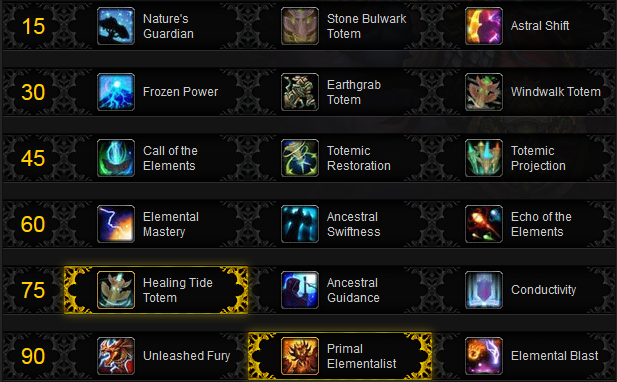 Tier 45: Totemic restoration is rather weak. Totemic projection is situational but can be strong, any time the raid is spread out and you’re not in a good position for your healing totem to hit the majority of the raid. Examples are Rain of Blades on H-Wind Lord and the Tornado Gauntlet on H-Blade Lord. Call of the elements is kind of the default pick if TP doesn’t apply, it resets the cooldown on all our short-cd totems. The most obvious benefit is HST, getting 2 back-to-back every 3 minutes. But it works with other utility totems as well, like Grounding, Earthgrab, Capacitor, Tremor, and Stone Bulwark. So if no need for TP grab CotE and get an extra HST. Tier 60: Echo of the Elements is the weakest choice here for the vast majority of fights. If there is constant high damage, and low overhealing, it could be a contender, but the other 2 choices are too strong right now. Elemental Mastery gives you 30% haste for 30 seconds on a 90 second c/d, kind of a personal mini-heroism. The 90 second-c/d is a nice change because it helps line up with our 2 major 3-min c/ds, HTT and Ascendance. If you can space them out 90-secs apart, you will always have EM up for use with them, which boosts both significantly. This lines up perfectly where the big damage spike are 90 seconds apart (H-Jin’rohk). Ancestral Swiftness give us a 5% spell haste buff and and instant-cast spell every 90 seconds. The personal spell haste is very nice, taking this talent or not taking it has a drastic impact on what haste breakpoints we can reach (more detail in stat section below). The c/d is an excellent “oh crap” button or can be used to cast while moving. Tier 75: Conductivity seems to be the weakest choice here, it is a passive effect so the benefit is always there, but for this to be viable the situation would have to be extremely specific. Usually when the raid is stacked inside your Healing Rain and there is a lot of incoming damage, Chain Heal will be the go to aoe healing spell. Possibly with the T15 4-pc making our single-target spells stronger this might be more viable, but your raid will probably want a c/d from you on heroic fights. Not discounting completely but not a great choice. Healing Tide Totem is the go-to choice in this tier, and has been since the beginning of the expansion. Universal choice for good resto shaman in MoP’s first tier, HTT heals 5 people at a time for a huge amount. Pretty straightforward, just set it and forget it. Ancestral Guidance is a personal favorite of mine, mainly because of how overlooked it is. HTT is the choice of most fights, but in the right situation AG gives you a c/d that is nearly as strong with a 1-min less c/d. This can mean 1-2 more uses of AG vs. HTT on fights with damage spikes every minute or so, like H-Jikun, Meraera, and Tortos. AG works basically like a weaker Ascendance, it’s healing is dictated by how much healing you are doing. So if everyone is spread out (Dark Animus), HTT will be MUCH stronger. If there are frequent periods where the raid is stacked, and lots of incoming damage, AG can really shine. Tier 90: Elemental Blast is hard to justify, its buff is unpredictable and requires you to use a 2-sec cast. There are situations where it can shine, but overall not a strong choice. Unleashed Fury gives you a +50% buff to your next spell cast on the target. This works different than Unleash Life; UL puts a buff on YOU that does +30% on any spell (should be healing rain). UF gives THEM a buff for +50%. The can be combined, making a heal nearly twice as strong as normal. This is a good talent for tank healing, which is more of a 10-man situation. In 25s unless you are specifically designated to tank-heal, I would avoid. Primal elementalist upgrades our 2 elementals, and for resto gives us a one-minute long 10% healing done buff on a 5-min c/d. The Earth Elemental version also gives us 20% less damage taken for the entire minute. Planning out your elementals, both when to use them and where, makes a HUGE difference in our healing abilities. A big part of this is preparation, and knowing about how long a fight should be. World of Logs helps immensely for this. Usually planning elementals is a balance of high-damage phases and getting the most uses out of them. For example, if a fight is 7 minutes exactly, you could use them from 0->2 minutes and again from 5->7 minutes for the most uptime. However, if analyze damage taken & healing done during those 7 minutes and see a huge spike around the 3-4 minute mark, and minimal healing the rest of the fight, holding off might be the best bet. Glyph of Cleansing Waters – Adds a heal to our dispell. The heal is small, and a set amount (not affected by our stats). However on fights where you will do a lot of dispelling (H-Horridon, H-Megaera), it’s a decent option. Would be much more useful if we could dispell posions and/or diseases like a REAL healer. Glyph of Totemtic Recall – Gives you 100% mana back from any totem you recall. Using this glyph and recalling totems at 1-2 seconds left is a HUGE boost to our mana. Even if you only use this for your elementals, and let’s say half of your HSTs (the ones during low damage phases), it will still be a very noticable benefit. Very much recomend this glyph. Glyph of Telluric Currents – Although TC is not as strong now as it was during Cata, this still is a very handy glyph. It only gives you +1,740 mana per LB cast, but there are many fights where the rhythm of incoming damage gives you time to weave in LB’s between high-healing periods. On fights that require us to attack something, (pink dinos on H-Horridon, crystals on H-Tortos), this glyph is even more handy. Recomend this glyph but it can be situational. Glyph of Healing Stream Totem – Very situational glyph, but can shine in the right fight. Reduces fire/frost/nature damage by 10% for 6 seconds.. The 2-pc Tier 15 bonus makes is much stronger, spreading the 10% damage reduction buff to 2 players at once instead of 1. A good example of this glyph really shining is Lei Shen, when you break into small teams to absorb Static Shock, throwing out free 10% damage reduction buffs can be a lifesaver (in addition to almost all damage in that fight being Nature). Glyph of Healing Wave – Choosing this or not will depend entirely on your playstyle and how much you use HW. The self-heal is small and often overheals quite a bit, so I would only take this if you use HW a lot & have no other good choices. However, it can be very solid if your healing style is HW heavy. Glyph of Spiritwalker’s Grace – Although this glyph does not seem overly strong, there are fights where it can make a big difference, especially if your 3rd glyph spot is open. Fights where moving is unavoidable (near the end of H-Tortos from turtles knocking you up in the air & Durumu’s maze) can really benefit from you having this. Not a strong choice even on ideal fights, but often our 3rd glyph choice is somewhat “meh”. Glyph of Riptide – Another glyph that is very dependant on your playstyle. Personally, I have only used this a handful of times, and am not a fan at all. A massive reduction to the initial heal (which should be the lowest overhealing part of your RT) is not what I want from one of my 3 major glyph spots. However, I know some excellent shaman healers whoswear by it. The idea of the glyph is to spread many RT HoTs around the raid, and have Tidal Waves uptime as close to 100% as possible. Not recomended. Glyph of Chaining – Much more of a 10-man glyph than a 25, this doubles the distance that your CH can jump, but adds a 4-second c/d. Could be situational even in 25mans if there are no stacking phases, but not highly recomended. Glyph of Fire Elemental Totem – Turns our current 1-min ele with a 5-min c/d into a 36-second ele with a 3-minute c/d. Using this depends on the length of the fight and how exactly the damage phases are positioned (see section on Primal Elementalist Talent), but it can be very useful in the right situation. One big benefit of this is being able to always have a 10% boost to HTT. If you are taking this glyph, I would recomend Totemic Recall even more highly than normal, to recall those additional Fire Eles. Resto shaman are unlike some other classes in that there are no stats we are actively avoiding; there are many combinations that work, and how many of each stat you want depends largely on your playstyle & group comp. Like with almost everything else, the best way to find out something for yourself is to test it out & analyze the results. There are no resto shaman baseline stat weights that are the same for everyone. And no matter how many times you read “Mastery to 50%”, that is not a magic number. Intellect – Increases SP 1:1 and crit very slightly. Not a secondary stat (the ones you can reforge back and forth), very straightfoward; getting more will increase all your healing done moreso than anything else. Spirit – Our main source of mana regen, spirit determines how much Mp5 we get in combat and also how effective our Mana Tide is. The amount of spirit you need is different for everyone, just make sure you are comfortable with how much you have. Whether that means 5k or 15k, make sure it works for you while still putting the most amount of points into crit/ mastery for output. There is an issue right now with HST and HTT haste breakpoints; basically, depending on your latency, you will only get the # of ticks you are supposed to SOME of the time. I encourage people to do testing on this and decide for themselves what is worth it. For me, the 20.01% breakpoint did not give me the correct number of ticks every time until I was at 21.5% haste. Main takeaway from this is that those breakpoints are NOT to be treated as concrete like the other ones, atleast until you have tested them. Crit – Increases the % chance that our healing spells will crit. Like mastery, affects all of our main spells & abilities. Crit is very important for resto shaman this xpac, for a few different reasons. Obviously crits make our heals bigger, but also increases the chance to proc Resurgance, and for single-target spells increases the chance to proc Ancestral Awakening. Crit is much, much stronger in MoP than it was for us in Cata. At level 90 it’s 600 crit rating = 1% crit. Mastery – Our mastery increases how much healing your spells do on targets, based on their HP. The lower it is, the more you do. This makes our mastery very dependant on your personal situation, and almost impossible to put a value on it or set a “magic number”. Also important to note that it is dependant on your raid comp; with how strong H-Pallies and disc priests are atm, who you heal with has a huge effect on your mastery level. I currently run with 1 disc priest and 2 holy pallies, all of whom are very skilled healers, and because of that I value Mastery lower than any other stat. If you have no absorb class in your healing crew, I would advise Mastery very highly. Gemming: Because you get 2:1 Spirit:Int from gems, and 1:1 from food & flasks, it’s a good idea to gem spirit in every slot until you reach whatever number you are comfortable at. Then eat & flask for INT. If you need to eat or flask for INT but have some INT/SPI gems in blue sockets, trade them out and compare your overall stats in both situations. Legendary Meta: The new legendary meta is a HUGE boost to mana, give us a 4-second window of free spells (the spell has to land within the 4-sec window). There are many uses for this, and even though the spell is free you still get the resurgence return & full mana back from a Totemic recall. If Tidal Waves are up I would always suggest fitting atleast one Healing Surge in the window, good chance at 5k+ free mana and a large heal. With the meta being so beneficial to our mana, some people are recomending going up to the 7613 Haste BP with AS. This lowers spell cast time enough to fit more into the 4-second window, and you can take away a few thousand points of spirit to reach it and should feel mana being about the same. This also gives our Healing Rain an additional tick, which is a huge boost, especially for 25mans. I do like EM, and use it instead of AS quite often, but the 7613 thing is certainly a good way to go. Something to keep in mind once you get your meta and can test it for yourself. Alliance: Pandaren is the best choice for Alliance Resto Shamans currently. Others: Draenei provides another HoT (however on a long CD and not effective); Dwarf provides another defensive CD. Thank you for taking the time to read my guide on Restoration Shamans! If you have any questions at all please feel free to put a comment below and I will attempt to answer them as soon as possible. As always, if you find anything to be out of date, inaccurate, questionable, etc. please leave a comment or contact an editor as soon as possible. Finally, as we previously said, there is only so much you can put into a guide, so please read our Raiding Guides and Theorycraft Essays regularly, as many of them will be about Resto Shamans. Happy Healing!